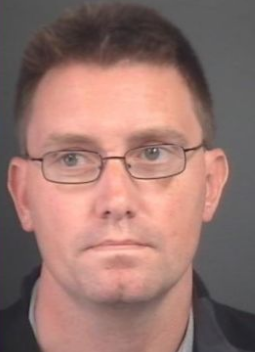 Eugene Tyrrell, 43, formerly from Hedge End, had been on the run for five years after being arrested for inciting sexual activity with a child. But thanks to the determination of a team of Hampshire officers and a six-year investigation, today he has been jailed for 21 months. It comes after Tyrrell pleaded guilty at Southampton Crown Court to two counts of inciting sexual activity with a child and one count of failing to appear at court in April 2013. The court heard how Tyrrell was first arrested in February 2012 following allegations that he had been sending indecent sexual messages to two young girls via social media. He was charged in December that year and pleaded not guilty to the charges in March 2013. But just two days after that appearance he fled to South Africa and failed to attend his next court hearing in April. A warrant was issued for his arrest and the hunt for Tyrrell began. Detective Constable David Thomas located Tyrrell via Interpol in South Africa. But due to a halt in extradition proceedings from South Africa between 2013 and 2016, DC Thomas was unable to force his return. However, DC Thomas persevered and as soon as extraditions between the two countries began again in 2016, the papers were finalised. Tyrrell appeared at the Magistrate Court of Pretoria in March 2017 but he then appealed his extradition. It wasn’t until the following year, in February 2018, that the High Court of Pretoria rejected his appeal and his extradition was upheld. In June 2018, DC Thomas flew to South Africa and re-arrested Tyrrell at Johannesburg International Airport, bringing him back to the UK to face his charges. Today he was sentenced to 21 months and given a sexual harm prevention order for 10 years.